It’s kind of like that time you were eating dinner and a cockroach scampered across the table. You instinctively pulled the fork full of spaghetti out of your mouth and skewer the bug in one fluid stroke. Do you then casually wash off the fork and finish your dinner or do you burn the tablecloth and take a 30 minute shower? Biff books make great gifts! A roach once crawled up my pj pants leg. I thought I was just suffering from imaginary tickle from having SEEN a roach, but…. Yeah. I reached down and grabbed it through my pants, and I didn’t want to feel it roll down my leg, so I took my pants off without letting go, then I shook them well after the damn thing had fallen out JUST TO BE SURE. I showered and put on shorts. Now I always ALWAYS pull my pants legs up when I’m out and about the house at night. ..I can honestly say I’ve never been stupid enough to stab a cockroach with my fork. Once, I examined an apple before my friend ate it. I told her that I wouldn’t eat it, because it had evidence of a bug-invasion. She ate it anyway, and ended up finding half of a still-moving cockroach with teeth marks in its side. I didn’t even know cockroaches liked apples. Normally I’m pretty good with bugs. But once I was at a function where we required sleeping bags. I woke up to find a cockroach sitting right. In front of me. Needless to say I woke up all my friends as I chased the thing around the room, scooped it up, and tossed it outside. You raise the fork and eat the roach. What are they, like 98% protein? Yeah, just pull the legs off first. That’s where the stuff that’ll kill you lives. Cockroaches carry diseases. and so it would be unwise to eat them. I have never eaten a roach, however I did have a wood-roach fly into my pocket. When I was a kid I had a horrible stomach illness that lasted several weeks. My mom made pancakes for me to celebrate when I finally felt like eating again, and they were great until one went “crunch” –apparently an earwig had sneaked into the bisquick. Back to the toilet I went, and it was another couple days before I felt like eating again (and it would be months before I could even look at pancakes). If roaches carried as many virulent diseases as rumored, then nobody would have survived my high schools cafeteria food. They are nasty things still. Remember, for every one you see, there is about a dozen more you don’t. And after WW3 the planet will be theirs. Don’t think I’ve ever seen a centipede in the house. Millipedes, though, those things creep me out. Nothing needs that many legs. Im ok with most “bugs” but centipedes…no. I used to work in an environmental testing lab — one of the things we tested for was pesticides, so we couldn’t use pesticides in the building. We had a really bad centipede infestation, which I discovered by going into the women’s bathroom and had a zillion of them crawling all over the floor, walls, etc, and a few [maybe 4 or 5] fell on me from the ceiling. I decided I could cross my legs the rest of my shift. Usually, such bugs are attracted to moisture. I worry more about the other bugs mentioned this week. Hm….if I were eating and I saw a roach…I’d move my plate away from it and ignore it, or try to squish it with my glass. That’s what I usually do. My friend just flicks them away with her fingers. I only ever see them at her place – my house just has ants. Thank goodness for that; you can eat ants without noticing, but inch long roaches? Crunch. What’s that taste…? One of the first times I was at my boyfriend’s apartment I saw 3 roaches on his kitchen counter eating something that had been spilled and not cleaned up. I pointed this out to him so he grabbed a box of noodles off the counter and smashed them, and left the noodles sitting there. A couple of weeks later I went to his apartment again and in the kitchen was the same spot of food and the noodles were still sitting there, I lifted the box and saw the dead roaches… yeah, he isn’t my boyfriend anymore. Eww….the creepy thing about House Centipedes is that they are GOOD bugs. Kill them off, and suddenly you have a roach/spider/everything else horrible infestation. But DANG, are they Ugly! I’m glade I live where I do we don’t have the roch issues then again the cats would most likely eat any and all they seen anyway. As for bugs in a whole unless its a jumping spider I well just flick,crush, or flush them. @ Patti–In the future, spray the bugs with a cleaning solution like 409 It kills them (clogs their breathing pores) and cleans up afterward. @Wizard For some reason, millipedes don’t bother me as much as centipedes do. Maybe it’s the length of the legs, or something. @Cari I’ll have to try that. Though I know spray air freshener doesn’t work. @patti But never use wasp spray on centipedes unless you’re disgust resistant. Usually when I see centipedes, I can manage to trap them under a dish and take them outside to smash with a brick. The dish is just fine after I wash it, as long as I squashed the bug -after- I took the dish away. Wow… that’s really horrible. And nasty. I feel sorry for your friend. Roaches here in Japan are nasty: they’re pretty big (about 3cm long I’d guess), and they can fly. Fortunately I’ve only ever had two inside my house. A much more common insect here is the Cicade. They are huge, can fly, but are perfectly harmless. The only drawback is that they make a lot of noise and there’s a lot of them. You won’t be getting much sleep in the summer if there’s a tree next to your window, they are so loud. I tolerate all kinds of bugs pretty well and have eaten fried locusts on at least two occasions (not extraordinarily tasty, I might add, but good protein source) so I wouldn’t have any problem with a house centipede, although I’ve yet to see one “in the flesh”. My girlfriend, on the other hand, would never tolerate being in the same room with a cockroach, let alone actively trying to kill it. Usually she just shrieks, runs out and leaves me (or her cat if I’m not available) to do the “dirty deed”. It’s nice that in alaska that there’s no roaches and centipedes. 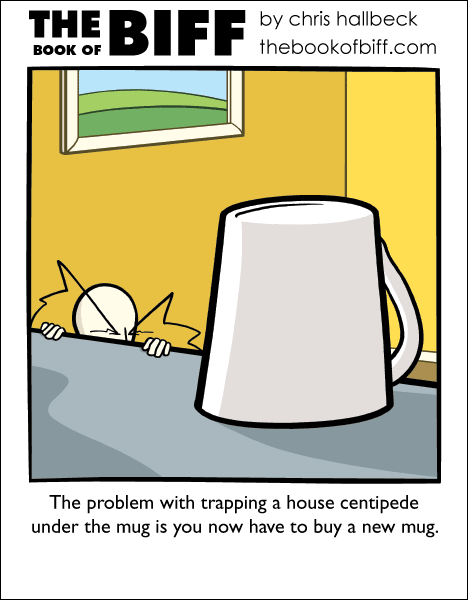 I have recently discovered that centipedes are one of very few insect/bugs to actually creep me out. Most don’t due to having a cottage my whole life. I have in the past walked through a spider web and not bothered to wipe if off my face for several minutes (I knew there was a high likelihood of walking though more). Most bugs I can casually squish with the back (or front) of my hand, paper towel/tissue at most. Centipedes though, they require some sort of squishing device. Same with Warrior Ants but less because they are creepy and more cause I know they can bite. I would probably grab a different fork and finish my dinner. I can’t go wasting spaghetti like that.